To reconstruct and revive the scientific thoughts, intellectual achievements and the outstanding industrial knowledge of the ancient Tamils for the use of the contemporary society. To study the grammatical and linguistic theories of Tamil language. To study the structure of Tamil language and the potentiality of Tamil Language. To create modern methods for language teaching. To translate rare books of Tamil into other languages and vice versa. To preserve and publish Tamil inscriptions, palm-leaf manuscripts, rare-paper manuscripts and rare books. To publish encyclopedias related to literature, grammar, science and technical glossary and Philosophy in Tamil. To recover and publish the lost cultural components of Tamil and the historical monuments through systematic research. To facilitate research on the cultural impacts of the Tamil Diaspora and the foreign relations of Tamizhakam. The mission of the University is to further the advancement of high level learning and research on Tamil language, literature and culture. The focus is not just on existence, but on excellence in all fields of knowledge for the benefit of the society. The core values and graduate attributes such as quality and enhanced understanding that a student should develop as part of the learning process are taken care by Tamil University’s vision and mission, and its motto ‘Ulluvathellam Uyarvullal’ (Aim Higher Always). Tamil university believes in inculcating professional values and ethical behaviour. 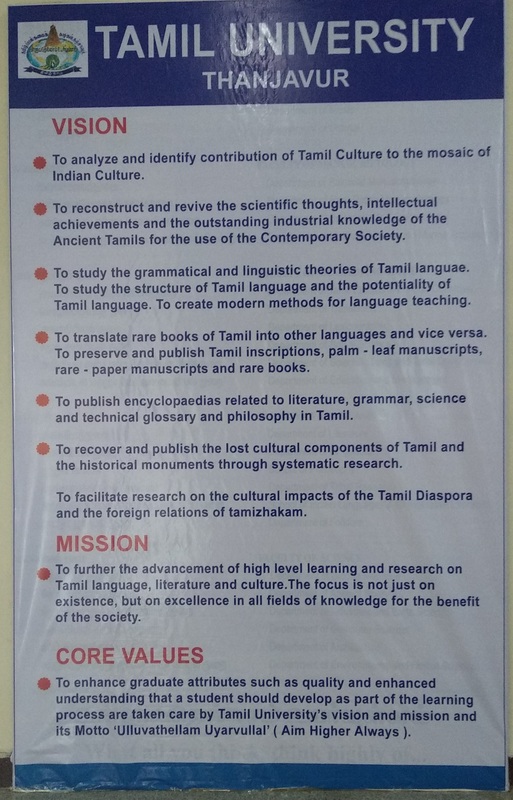 The core values found in the ancient Tamil texts are disseminated among the public and students through programmes, discourses and lectures. ‘Wisdom is finding the validity and truth of the information, whatever is its source’ is one of the maxims of the Tamil poet saint Thiruvalluvar. Tamil University seeks to search for the advanced level of knowledge in the fields of arts, humanities, social sciences and sciences. Tamil University undertakes advanced level of research on Tamil Language, literature, culture and various universal disciplines. The spirit of enquiry is instilled among the students and researchers. Tamil University takes efforts to research on and spread the ideas relevant to the contemporary context found in the ancient Tamil texts. Tamil University believes in the protection of various traditional knowledge systems, language and culture through several measures. Tamil University aims to use scientific approach and methods in its research activities. It also adopts the latest technology in research, and presentation of information to all sections of the society. Tamil University promotes application oriented research and action for the benefits of society in the contemporary context. Tamil University believes that it has social responsibility to educate the people from all walks of life, especially those from the rural background and poorer sections of the society. Its student profile reflects its social responsibility.